Whereas most general practitioners find it challenging enough to treat the wide range of maladies they regularly encounter, Carlos Franco-Paredes has made a specialty of diagnosing diseases that few other physicians in North America have ever seen. 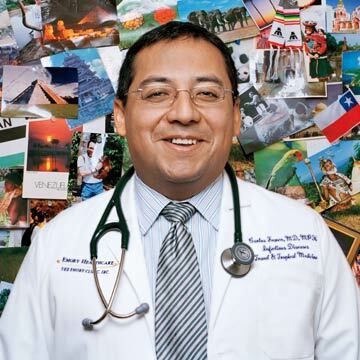 A co-director of Emory University’s TravelWell clinic in Atlanta, Franco-Paredes treats recent immigrants and other travelers with unusual symptoms who arrive at his office from far-flung places. Commonly called a refugee doctor, one of several hundred in the United States registered with the American Society of Tropical Medicine and Hygiene, he plies his trade at the intersection of cutting-edge medical advancement and the communications revolution. Q: What’s the most important diagnostic tool you use? A: The Internet. We rely on it heavily, probably more than other specialists do. Online, we access recent medical journals from all over the world, including PLoS Neglected Tropical Diseases and the Journal of Infectious Diseases in Developing Countries. They have really good articles written by people on the local level. But beyond that, we use the Internet to keep up on what’s happening in various cultures. I read international newspapers and the Websites of the U.S. State Department and refugee organizations. Q: Why is the cultural aspect so important? A: Well, for example, I’m going to see someone tomorrow from southern Sudan, a gentleman of about 45. He came to me with complaints of abdominal and back pain. Now, we know that the Sudanese in particular have a high rate of parasitic infection—strongyloidiasis and schistosomiasis. Exposure to parasites through contaminated water and soil has been very common in their region, especially since the start of the civil war. But in the Sudanese man’s case, we did the tests and everything came out negative. Then one day we were talking, and I learned that he has horrible nightmares about warriors piercing him with spears. It turned out that what he really was experiencing was post-traumatic stress disorder. Q: You started in this practice five years ago. How has the field evolved since? A: Back then, a lot of attention was paid to HIV/AIDS and malaria, both major global health problems. These days there’s a lot more interest in some of the so-called diseases of poverty—such as Buruli ulcer, leprosy, African trypanosomiasis and Chagas disease—that impede individuals and populations from reaching their full economic and social potential. These conditions are not necessarily associated with a high mortality rate but with disabilities. The notion is that there’s likely to be a significant and rapid return in terms of preventing those disabilities if you invest in controlling the diseases now. Q: How can you communicate with people who speak so many different languages? A: We work through interpreters when necessary. But I’ve found that it’s important to pose the questions correctly, especially if an interpreter is involved. You can lose the nuance that might mean the difference between treating someone successfully and not. Many Africans are lactose-intolerant, but if you ask them in their language, “Do you like milk?” the answer is often yes. I’ve learned to ask instead, “Does your stomach like milk?“ and to that they’ll often say no. Q: What’s the strangest disease you’ve come across? A: Echinococcus disease, which comes from Iraq and parts of South America and Southeast Asia. It’s carried by dogs. The result is large cysts or water-filled tumors in the abdomen, liver and lungs. Q: Do we need to worry about refugees and other travelers bringing unusual diseases like that to America? A: The risk is very small. Most tropical infections that we deal with in immigrants and refugees from exotic places are generally not transmissible. Among those that could be transmissible—such as SARS, avian influenza or viral hemorrhagic fevers—most are introduced into the United States not only by refugees or immigrants but by all other kinds of travelers. Also, diseases such as tuberculosis and leprosy, frequently found among immigrants and refugees, are already here in the United States.